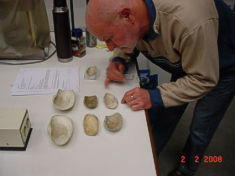 When you collect fossil shark teeth, mollusks or other fossils from the Tertiary and Quaternary, or when you are interested in other aspects of the geology of this period in Earth's history, membership of the Werkgroep voor Tertiaire en Kwartaire Geologie (WTKG; Tertiary and Quaternary Research Group) is something for you. We are an active Dutch research group, accessible for both amateur and professionals in all fields concerning Tertiary and Quaternary geology in the widest sense. We offer excursions, meetings, we have our own library and we issue two periodicals, one of them being the international English language scientific periodical Cainozoic Research. 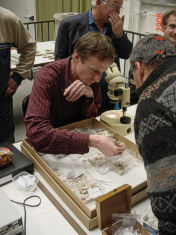 During the year we organize three to four meetings throughout The Netherlands, allowing our members to meet and discuss all things Tertiary and Quaternary, such as collecting sites and taxonomy. 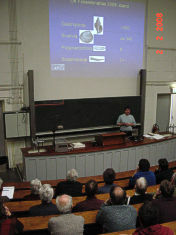 Also professional talks concerning Tertiary and Quaternary geology are held for the research group, sometimes by members of the WTKG. Impressions of our meetings are available below. 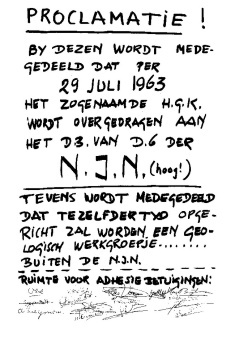 We issue two periodicals: our popular Dutch periodical Afzettingen WTKG appears four times a year and features local scale research by our members as well as announcements by the board. The internationally known English language scientific periodical Cainozoic Research, appearing twice a year features high quality original scientific papers of international authors and importance. We offer different excursions throughout the year. 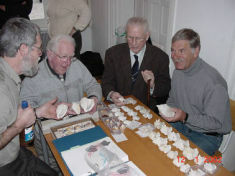 Generally, excursions are held at sites where collecting of fossils is possible, but also more theoretical excursions are offered. The library of the WTKG includes many titles as well as series of periodicals concerning Tertiary and Quaternary geology. Members of the WTKG can freely access the library.